Nestled in between the American Embassy and the RDS you’ll find the ever-calming presence of Herbert Park. It was named after Sydney Herbert who was the father of the Earl of Pembroke and in 1903, it was given to the Urban District Council to be made into a public park. Herbert Park has many facilities including tennis courts, playgrounds, a beautiful pond and, a recent addition, a fully stocked cafe in Lolly and Cooks. One amenity that potentially isn’t as obvious is the native tree trail guide. So what is a native tree? These are the trees that have grown naturally in a place without any human involvement, planting or interference and in many cases, they are ancient. Ireland’s native trees began to appear after the last Ice Age, carried over by birds with the lighter seeds travelling on the air. What better way to ring in the spring season than a walk in nature? The activity booklet is all ready to download for free from the PDF on DCC’s website. 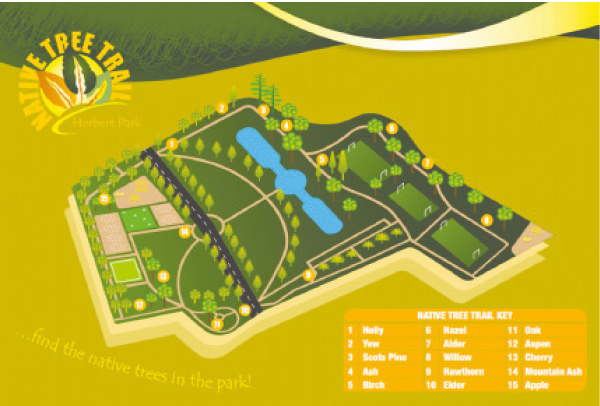 Included in the booklet is a guided map of the park, information on all native trees and their natural habitat along with some interesting facts about the different properties of each tree and their relation to Irish history. There are 15 different trees to hunt down and record in the booklet, so you’ll need to bring a pencil at the very least if you want to take decent leaf rubbings. After you’ve become an expert on the native trees, there’s a little quiz at the end to test your knowledge, with answers included in the small print. The guide booklet is charming, colourful and funny and would make for an excellent family day out activity. A word of warning though, unfortunately, it does not answer the eternal question “if a tree falls in the forest, does it make a sound?” So, we’ll have to keep puzzling over that one.